The AMX 13 75 is a French tier 7 light tank. Maneuverable light tank with an oscillating turret and a 75 mm autoloader gun that could fire up to 10 shots per minute. At that time, the gun on this vehicle had superior penetration compared to the guns of most other medium tanks. The tank has a decent top-end gun and good dynamic performance. The magazine reload is also better than its predecessor. 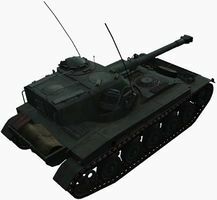 Something to note is that the gun depression of the AMX 13 75 (and AMX 13 90 in extension) is much better than the AMX 12t's. Its gun elevation, however, is even worse. The best way to play it is to let others go ahead, and when they make contact go and support where you can. 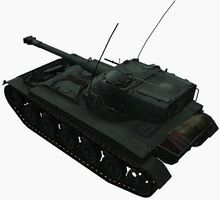 Due to its speed, the AMX 13 75 can easily move between engagements, deliver 4 rounds, and then retreat while reloading. 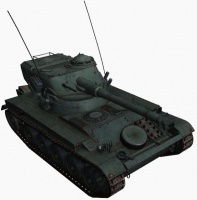 The AMX 13 75 leads to the Bat.-Châtillon 12 t.
Fast reverse speed, as well as good acceleration (after 9.18). Highly outclassed by the American counterpart, T71, in nearly every aspect. Slightly below average penetration for a scout of the tier, but much closer after other scouts got penetration nerfs. Modules are fairly close to each other, increasing risk of single shells, especially HE, damaging several modules at once. Low ammo count of only 36 rounds. 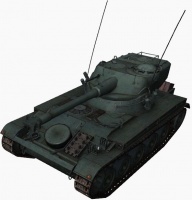 The AMX 13 75 is an evolution of the design concepts introduced with the AMX 12t. It keeps the good parts and fixes most of the flaws. Once upgraded, the improved accuracy of the gun allows for long-range firing, when desired. The wider tracks possibly improve off-road performance slightly. 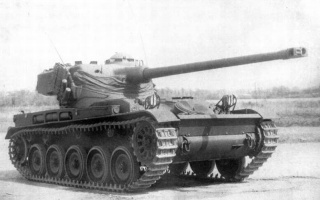 As with the AMX 12t, this tank is primarily a flanker. Use it to attack the side and rear, and finish off injured enemy tanks. Its main weaknesses are its weak armor and low penetration for its tier. Try not to play with heavies. With only three crew, a crew injury is often devastating. A First Aid kit is highly recommended. Be careful as you are outclassed by many other of your peers in almost every statistic. Playing passively will reward you towards end game, where there will be wounded, alone tanks which you can clean up easily with your autoloader. The time it takes to reload the drum with a full 100% crew and Improved Ventilation is around 12 seconds. This is able to be shortened further by Directives, Strong Coffee (a Premium consumable) and Brothers in Arms. It's also worth noting that the enemy often tries to destroy the AMX 13 75 as soon as possible. This is similar to the T71. However, this deficiency can be reversed and used to your team's advantage. That is, divert the attention of the enemy towards you until your allies take the position. Stock, this tank doesn't have sufficient weight capacity for any equipment other than Coated Optics, since it doesn't weigh anything. The Tank Gun Rammer and Vertical Stabilizer are unavailable on this tank. A Gun Laying Drive is useful for faster aiming. Fans of passive scouting can equip a Camouflage Net. Unfortunately, with the addition of the T71, this tank is almost useless practically when compared to almost every aspect of each other. Make use of APCR a lot, play more passively until late game, and make use of your good camo to stay alive and keep contributing to your team. Luckily, the next tank, the Bat.-Châtillon 12 t will reward you greatly. Finish up with the Detroit Diesel 6V53T engine and the SCR 528F radio. The AMX-13 is a French light tank produced from 1953 to 1985 (The AMX 13 75 version was produced until 1966.). It served with the French Army and was exported to over twenty-five other nations. 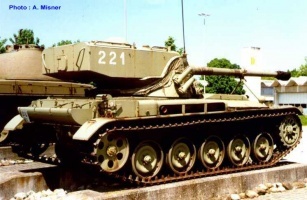 Named after its initial weight of 13 tonnes, and featuring a tough and reliable chassis, it was fitted with an oscillating turret built by GIAT Industries (now Nexter) with revolver type magazines which was also used on the Austrian SK-105 Kürassier. Including prototypes and export versions there are over a hundred variants including self-propelled gun, anti-aircraft systems, APCs, and ATGM versions. 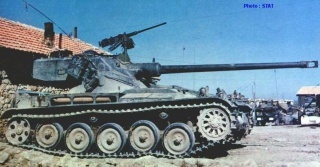 Sporting a modified version of the Panther's 7.5 cm KwK 42 L/70 gun with dual 6 round autoloading magazines, it allowed a quick succession of shots. However, it could not be reloaded from within the vehicle and required disengaging from contact, finding cover for the crew to dismount and reload, then re-engaging the enemy. Total production of the AMX-13 family is approximately 7,700 units, around 3,400 of which were exported. The tank was designed at the Atelier de Construction d'Issy-les-Moulineaux in 1946 to meet a requirement for an air-portable vehicle to support paratroopers, the first prototype ran from 1948. The compact chassis had torsion bar suspension with five road-wheels and two return rollers; the engine runs the length of the tank on the right side with the driver on the left. It features an uncommon two-part oscillating turret where the gun is fixed to the turret and the entire upper turret changes elevation. The turret is set to the rear of the vehicle and holds the commander and gunner. The original 75 mm gun, allegedly modelled on the German 7.5 cm KwK 42 L/70 gun (used, among others, in the Panther tank) but firing very different ammunition from a shorter barrel, was fed with an automatic loading system in two six-round magazines located in the turret's bustle. The twelve rounds available in the loaders meant that the crew could engage targets quickly, however once those rounds were expended the vehicle had to retreat to cover and the crew reload them from outside the vehicle. Production began at ARE (Atelier de Construction Roanne) from 1952, with the first tanks delivered the following year. 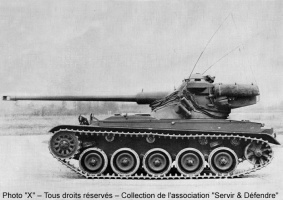 In 1964 production was transferred to Creusot-Loire at Chalon-sur-Saône, as the ARE moved to building the AMX 30 MBT, and the numbers produced declined significantly. This page was last modified on 24 May 2018, at 18:43. This page has been accessed 46,445 times.